Google Mobile Displaying "Slow" Label In Search Results For Slow Sites? Home > Google News > Google SEO > Google Mobile Displaying "Slow" Label In Search Results For Slow Sites? It seems like Google may be testing a new label in the search results for slow sites. 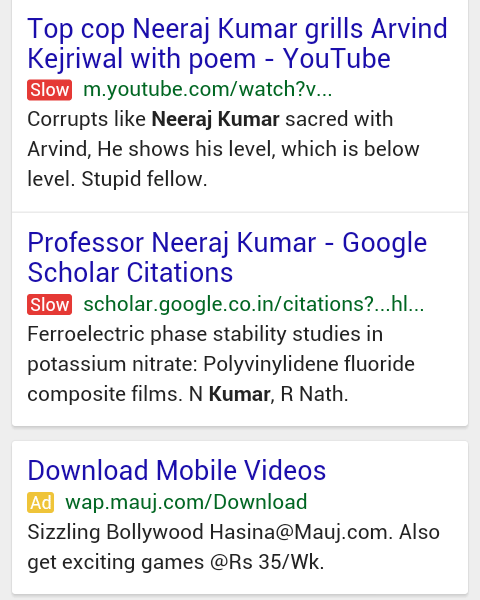 K Neeraj Kayastha posted a screen shot of the "Slow" label in a Google+ community and said he spotted this on his Android device searching in incognito mode. As you know, page speed is a ranking factor for both desktop and mobile. Your site really needs to be incredibly slow for it to impact your rankings but it is still a factor. But this is the first time I have seen a "slow" label in the search results. It seems like this is not an extension, because he is surfing in incognito mode. This reminds me of when Google began testing and ultimately displaying the mobile friendly label in the search results. Have you seen the slow label?